A group of upcoming bartenders from Heritance Kandalama and Heritance Ahungalla Hotels walked away with key wins at the recently concluded National Bar Tenders’ Cocktails and Flair Competition 2012, organised by the Ceylon Hotel School Graduates’ Association. Indika Kumara Marasinghe, Praveen Sampath Fernando, Gihan Sadanayake, Iresh Tharanga Mayadunna, Sithara Wickramasinghe and Roshan Madushanka Malagammana grabbed the limelight for their flaring and innovation. “What is noteworthy is that all of them joined us in trainee positions from remote parts of the country. They worked hard, moved up the ranks and never passed up an opportunity to learn new skills, which is very encouraging for us,” said Mr.Malin Hapugoda, Managing Director, Aitken Spence Hotels. Bringing pride to Heritance Kandalama, 27-year-old Indika Kumara Marasinghe, a native of Pelwehera, Dambulla, was adjudged the winner of the National Marie Brizard and Skyy Vodka Bar Tenders’ flaring competition. As the winner of the flaring competition, Indika will now represent Sri Lanka at the prestigious South Asian Regional Bartenders Competition which will take place in Singapore. Indika, who once dreamt of representing his school and village club at cricket, joined the hotel as a trainee in August 2006. He got interested in mixing and flaring cocktails while working at the hotel bar. His interest was further ignited after he saw a video of a popular American flaring barman. Marasinghe, used his flair for cricket to try his hand at mixing cocktails at a competitive level. With a great dose of perseverance, patience and a lot of self-study, he faced his first competition in 2008. He was adjudged the regional winner (Cultural Triangle) at the Marie Brizard Bartenders competition in the years 2009, 2010, 2011. His big win came when he emerged winner of the Marie Brizard and Skyy Vodka National Bartenders’ flaring competition this month, beating all star-class barmen in the country. Flaring and juggling is an art that requires endless practice, said Marasinghe. “This is a job with lots of skills not only the knowledge.” “You can watch a movie and learn techniques but to perform in front of a large number of guests and an audience, you should tirelessly practice, practice and practice,” a jubilant Marasinghe said. Another shining star at the National Bar Tenders’ Competition 2012 was Praveen Sampath Fernando, who secured the First Runner Up award in the Classic Cocktail category, representing Heritance Ahungalla. Praveen began his career as an hotelier in the year 2007 as a trainee waiter at Heritance Ahungalla. A native from Ahungalla, Praveen shone amongst 300 participants at the competition when he emerged runners up after making it to the finals along with 15 other participants. Fernando calls his signature cocktail “Green Republic” which includes a dose of Skyy vodka,creme de menthe green, Monin apple syrup, banana liqueur, peach and passion. Gihan Sadanayake, who began his career at Heritance Kandalama as a trainee waiter in December 2009, has participated in many regional bartender competitions. In 2012, he qualified for the finals at the National Bartenders competition. Sithara Wickramasinghe, a trainee hostess at the hotel since December 2011, also got selected to the final round of the National Bartenders competition in 2012. Iresh Mayadunna, who joined the hotel as an Assistant Waiter in December 2011, made it to the semi-final round of the competition while Roshan Malagammana, a waiter since 2009 also made it to the semi-final round at the recent competition. Secretary/CEO – CA Sri Lanka, Mr. Aruna Alwis; Vice President – CA Sri Lanka, Mr. Arjuna Herath; President – CA Sri Lanka, Mr. Sujeewa Rajapakse; Deputy Chairman / Managing Director Aitken Spence PLC Mr. J M S Brito, Chief Financial Officer Aitken Spence PLC Ms. Nilanthi Sivapragasam; and Director/Chief Human Resources Officer Aitken Spence PLC Mr. Rohan Pandithakorralage. Sri Lanka’s leading blue-chip conglomerate, Aitken Spence PLC has come onboard as a lead sponsor for the Institute of Chartered Accountants of Sri Lanka (CA Sri Lanka) to help carry out its development activities for the year. 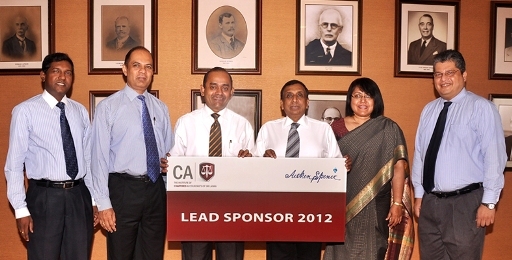 This is the second year in a row, Aitken Spence has reposed its confidence with the country’s national body of accountants, which is among the foremost and largest professional organisations in the country with a membership of 4200 chartered accountants and over 37,000 students aspiring to be chartered accountants. The sponsorship cheque was officially handed over to CA Sri Lanka President Mr. Sujeewa Rajapakse by Aitken Spence’s Deputy Chairman and Managing Director, Mr. J M S Brito recently. The sponsorship will assist the institute to carry out its numerous educational and professional activities for the benefit of its student’s, members and even professionals from non-accounting sectors throughout the year. Welcoming Aitken Spence onboard for the year 2012, CA Sri Lanka President Mr. Sujeewa Rajapakse commended the country’s leading blue-chip conglomerate for playing an important role in assisting the Institute to conduct its activities and help advance the accounting profession further. “Aitken Spence’s role as a lead sponsor for a second year is also an endorsement of the institute’s mission to continue to serve society by promoting and developing the accountancy sector continuously,” he said. Aitken Spence’s Deputy Chairman and Managing Director, Mr. J M S Brito stated that Aitken Spence with its leadership in several strategic sectors of the Sri Lankan economy is steadfast in fulfilling its responsibilities to society as a part of its commitment to sustainable business which results in shared value creation. “As an industry leader, Aitken Spence has over the years, pioneered many new innovations and best practices across many of the sectors it operates in, which has helped raise the bar of business performance in Sri Lanka. We take our responsibility to engage and contribute positively to the economy and society as a fundamental aspect of how we do business. It is in this light that we are pleased to announce our continued support to CA Sri Lanka, which is one of Sri Lanka’s oldest and largest professional bodies, with the aim of strengthening the country’s human capital to drive Sri Lanka’s development towards a sustainable path,” he added. A chartered accountant himself, Mr. Brito noted that chartered accountants have over the years played an important role in the growth and development of Aitken Spence. Established in 1868, Aitken Spence PLC is a leading player in Hotels, Travel, Maritime Services, Logistic Solutions and Power Generation in Sri Lanka, while the diversified conglomerate also has significant interests in Plantations, Insurance, Financial Services, IT, Printing and Garments. Listed in the Colombo Stock Exchange since 1983, today Aitken Spence has operations in six countries spanning South Asia, the Middle East and Africa. Heritance Ahungalla, one of Sri Lanka’s Aitken Spence Group’s deluxe hotels, has employed scores of people and sources supplies from the neighbouring villages as part of the ongoing investment drive to embrace sustainability. More than 65 percent of the hotel’s staff of 400 have been recruited from the local villages, many of them have not had previous hotel experience. Those from the local community, have risen up the ranks quickly, to enable Heritance Ahungalla to secure multiple awards for cuisine, service and environment practice. “We are proud of our growing team of young men and women from the surrounding communities, who have quickly adapted to high-levels of hotel management and also readily contribute to expanding our sustainability initiatives,” said Refhan Razeen, General Manager of Heritance Ahungalla. For instance, Shanika Jayasekara, who joined the Heritance Ahungalla family as a trainee restaurant receptionist in August 2009, rose up the ranks to a Senior Restaurant receptionist in April 2011. Along the way, Ms. Jayasekara also tried her hand in mixing cocktails, taking part in many cocktail competitions. “I don’t want to travel abroad. I’m happy to stay in Sri Lanka. In the future, I would like to specialise, maybe learn about wine and become a sommelier, rather than becoming a general food and beverage manager,” said Ms. Jayasekara who won the Best Mixologist of the Island at the 2011 Culinary Art Competition conducted by the Chef Guild. Another rising star, P S Fernando joined Heritance Ahungalla family in August 2007 as a trainee steward and now works as a Trainee Captain. He has also acted as personal butler for many celebrity guests including Indian cricket legend and ruling party legislator, Sachin Tendulkar and legendary British singer, Sir Cliff Richard during their stays at the hotel. A bartender and a deft cocktail mixer, Mr. Fernando has taken part in table-top decorating, power observation and tray balancing competitions. The Heritance Ahungalla family also includes children of retired staff members, differently-abled persons and more than 35 youths from the north and east who secured employment after one-year’s training at the Aitken Spence School of Hospitality. Mr. Razeen said a differently-abled person, employed as a trainee pastry cook, went onto win two golds and a silver medal at the Culinary Art competition in Sri Lanka. He later secured employment overseas and has since won gold medals in similar competitions in Dubai. Staff also receive training in English, French and German languages, computer skills, leadership training programmes and medical facilities. To enhance soft skills, the hotel conducts English drama competitions and environmental quiz competitions. Dressed in batik-motif uniforms, these rising stars are among the old-world charm that runs the decades-old 152-room luxury five-star coastal property. The Geoffrey Bawa designed hotel was the first to come under the Heritance brand, which symbolises Aitken Spence’s centuries-old heritage of trust and reliability. “We take great pains to stick to our core Heritance motto of ‘where tradition is alive,” said Mr. Razeen, who has declared 2012 a year of quality for the Heritance Ahungalla family. The hotel’s gastronomy journey deftly weaves the concept of ‘heritage’ and ‘trust’, with its signature Heritance cuisine which is designed around Sri Lanka’s spice heritage, herbs and abundance of local food. In 2011, Heritance Ahungalla won the best five-star resort trophy during the 2010 Sri Lanka Tourism Awards. Heritance Ahungalle’s roll of honour also includes efforts to conserve energy and preserve the ecological balance around its stunning property. In 2011, the hotel won a Bronze Flame award at the 2011 Sri Lanka National Energy Efficiency Awards. In 2012, the culinary team made a $35 million ‘Pirate’s Fantasy’ cake that was decorated with some of Sri Lanka’s most expensive gem stones. The cake is a contender for the “world’s most expensive cake”. The culinary team has also won multiple awards at culinary art competitions including the Best Hotel Team and Best Culinary Team in Sri Lanka after competing against both international and domestic star class hotels at the 14th Culinary Art Competition held in 2011. Mr. Malin Hapugoda, the Managing Director of Aitken Spence Hotels said the group is acutely aware of the role tourism plays to aggravate global warming and environmental degradation. “Heritance Ahungalla’s energy management system, focuses on effectively managing energy consumption without compromising the guest comfort. It also helps the hotel to meet the current and future mandatory energy efficiency targets and requirements of greenhouse gas emission reduction legislations,” Mr. Hapugoda said. Heritance Ahungalla was recently certified for Energy Management System ISO 50001:2011 and is the first resort in the world to receive the said certification. To minimise social risk in the environment the hotel operates, Heritance Ahungalle offers internships that also helps to build community relations. The hotel donates generously to the local community particularly to help children and elder care programmes.